(March 21, 2017) Construction has begun on the sidewalk that has been planned along Gallant Lane in front of Kennedy Middle School. 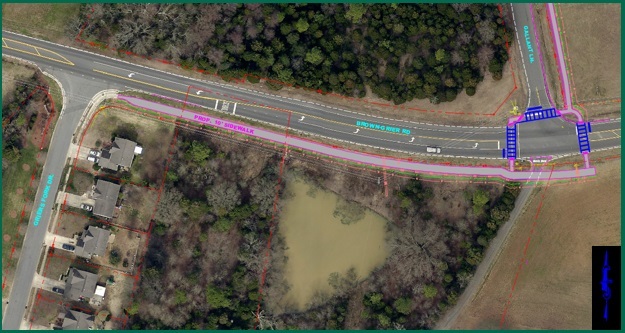 As the story from April 2015 below describes, the City of Charlotte is constructing a sidewalk along the south side of Brown-Grier Road from Griers Fork Drive to Gallant Lane and then along Gallant Lane to Steele Creek Elementary School. 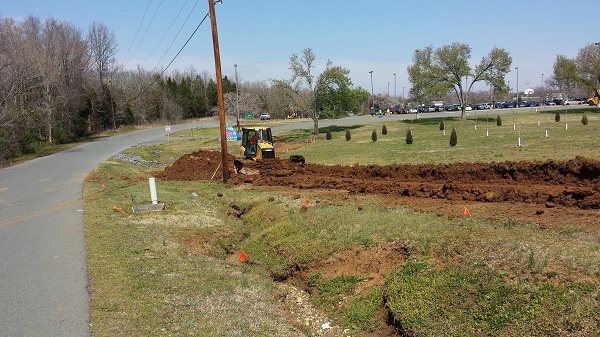 Workers also have been relocating utilities along Brown-Grier Road in preparation for constructing that sidewalk. In addition, the developers of the apartments at the corner of Brown-Grier Road and Sandy Porter Road are required, as a condition of their rezoning, to construct a sidewalk along the south side of Brown-Grier Road from Gallant Lane to Sandy Porter Road. According to city staff, a sidewalk will be in place along Brown-Grier Road from Griers Fork Drive to Sandy Porter Road and along the length of Gallant Lane by the time school opens this fall. The city also is planning major improvements to Brown-Grier Road as part of the for the Comprehensive Neighborhood Improvement Program (CNIP) for the Whitehall/Ayrsley area. See Community Input Requested for CNIP Road Projects (March 14, 2017). These additional improvements to Brown-Grier Road are at least three and a half years in the future. (April 27, 2015) Charlotte city staff released information about plans to build sidewalks along Brown-Grier Road and Gallant Lane at the public meeting on the Whitehall/Ayrsley Comprehensive Neighborhood Improvement Program (CNIP) last Thursday. As the schedule below shows, the sidewalks are expected to be completed by summer or fall 2017. "RE" stands for Real Estate Phase. Contingency and Reserve are always built into schedules as added time for weather, utility, or other delays . Click here: Brown-Grier Public Meeting or on the image below to see the information released at the meeting, including preliminary concept plans for sidewalks along Brown-Grier Road, in front of Kennedy Middle School, and approaching Steele Creek Elementary School. TWO Capital Partners, LLC has submitted a rezoning petition to build up to 291 apartments on the corner of Brown-Grier Road and Sandy Porter Road. See Petition 2015-045. Plans include sidewalks along the roads adjacent to their property. If the apartments are approved and built, the city will require sidewalks connecting those at Gallant Lane to those at the apartment complex. That would result in continuous sidewalks from Griers Fork Drive to Sandy Porter Road.